Extremely fortunate to come to His lotus feet when she was just a tiny girl in the 1940s, Mrs. Karunamba Ramamurthy, lovingly addressed as Kannamma, has a priceless treasure trove of incredible memories of the yesteryears. She is also the author of the famous book "Sri Sathya Sai Anandadayi - Journey with Sai". This is the second part of her wonderful reminiscences. In those days (in the 1940s), Bhagavan’s birthday did not call for any major celebration. Instead we enjoyed more experiences with the Lord which we now cherish for all eternity. Elderly devotees used to apply the customary coconut oil on His head and we would garland Him with bright flowers while singing bhajans. During one birthday, Swami refused everyone who came to garland Him. The ever playful Swami was enacting a divine drama. But He appeared serious all the same! The 20 or so devotees who had assembled returned with the garland still in their hands, rather downcast and perplexed. This was to have been the highlight of their year! Then they discussed how to attract the mysterious Lord to their side, and collectively requested Swami to partake meals with them. Swami asked them to sit inside the Mandir and then surprised the group by serving water and food to everyone with His own hands! Needless to say, they were all moved and overjoyed after their initial disappointment. There lived an old man named Kadirappa in the village who used to wash up all the utensils after devotees had partaken their meals. Generally, he ate the leftovers from these cooking vessels, and often, this comprised of just plain steamed rice, without any salt, or garnish, and was rather lacking in nutrition. Once, when this old man was eating silently sitting beside the well, Swami went into the kitchen and brought out all that my mother had personally cooked for Him. On one occasion, in order to put an end to what the elders thought was expensive and misplaced charity, the mother caught hold of Sathya, and with a finger raised in warning said, "Look here! You may give him food, but mind you, you will have to starve." The Chitravati River, in the forties, was very different from what it is today, and its flood waters used to come up to the base of the old Mandir, often flooding the basement. One day, during such a flood, Swami asked my mother to offer turmeric and kumkum (vermillion) to the river. She brought these items on a bamboo mat, and Swami placed this on the water and gently shoved it away. After this, with His feet, He slowly pushed at the lapping water as if He were sending her away. Lo! The waters receded peacefully at once! My mother stood there for some time enjoying this spectacle of the waters obeying Swami’s command, and felt rather in awe of the power evident in the small body of the Lord. small body of the Lord. Formal divine discourses on festivals and events like we have now, were not the practice 50-60 years ago. It was always casual conversations, but they were actually ridden with deep meanings. Whenever devotees gathered, He used to join them and sit in their midst. Most people used to ask Him about solutions to their personal problems such as about money for their businesses and so on. 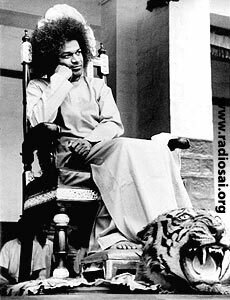 Once, after the River Chitravathi’s floods had abated, we were seated around Swami. Almost everybody was busy asking Swami about their respective professions and their future. The topics raised were almost exclusively of a materialistic nature. So saying, Swami went to the river accompanied by the group who were all agog at having their choicest desires soon fulfilled. After completing the heap and placing the stick on top Swami left at about 6.00 p.m. and returned to the Mandir. An hour passed by, but there was no sign of the devotees returning. Swami then asked Krishnappa, His body’s cousin brother, as to what happened to the group. “They have not turned up yet. Did a tiger attack them? Go see what has happened.” So saying, He sent Krishnappa to the river bank. When he reached the river, he saw a strange and comical sight - everybody was still furiously searching in the darkness. At odd intervals they thought they had found something and would start shouting “We got it! We have it!” When they lifted the object(s), to their dismay, they found only dried donkey dung, pebbles, and sand! Generally, Swami was the perfection of patience in dealing with our poor understanding. And often He came down to our level to play and establish kinship with us. But now and again, He felt He must teach us the hard way, lest we never move on from our petty desires. Of course, He would do so in a playful way that would give us all a belly laugh whenever we recalled those pranks. Despite the fun and laughter, there is always a profound meaning in all the Avatar says or does. This was clearly demonstrated by the assurance that He gave even in His previous incarnation at Shirdi when He advised His devotees thus: “There will never be any dearth or scarcity, regarding food and clothes, in any devotees’ homes. It is my special characteristic, that I always look to and provide for the welfare of those devotees, who worship Me whole-heartedly with their minds ever fixed on Me." Needless to say, she was overjoyed. She received it and started her journey back home. On the way she sat at Penukonda railway station awaiting her train. She took the coconut and moved it with her hands. While doing so she heard a sound inside that seemed to emanate from the coconut. A doubt crept into her mind. 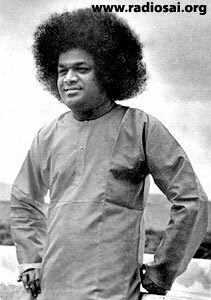 Was Swami’s gift genuine? Could a coconut really offer riches? Many such people came to Swami seeking such material wealth; very few were interested in spiritual riches. Even during the Shirdi incarnation, there is an instance of a rich gentleman who had every worldly success in life and appeared to lack nothing, and therefore came to Baba seeking the ultimate wisdom. We used to live in Mysore in those days. Traveling to Puttaparthi was a long and arduous journey. We had to first come to Bangalore by train, and there switch trains to reach Penukonda. Then we had to continue the journey by bus till we found ourselves in the small town of Bukkapatnam. The frequency of this bus was very low, effectively only one per day. Needless to say, it was overloaded with passengers, often seated one on top of the other! The roads weren’t actually roads, but only mud tracks riddled with potholes. Once we reached Bukkapatnam, we had to take to the bullock carts. And this was a journey of another two hours! Once we came across the sandy banks of River Chitravathi, we often had to cross by foot as the cart would get bogged down by our weight. After arriving at the eastern bank of the river, we had to trudge along a furlong or two to the old Mandir. But the homecoming was sweet. At the gates there would be Bhagavan Himself awaiting our arrival with a smile on His face! “Come, all of you, come. Have you also brought children with you?” Swami would usually ask. Sometimes, the trip would be so exhausting that we would fall ill. Once, when we visited Puttaparthi during the summer, we had to cross the hot sandy stretch that was Chitravathi by foot. After the ordeal, my mother and my son developed boils on their feet. However, we could not expect proper medication in the hamlet, and they bore it all. One day, during bhajans Swami came out, looked at us and started laughing. He told us that had they (my mother and son) washed their feet in cold water after the crossing, they would have been cured of the problem. He then advised us to apply a mixture of castor oil and cold water over my son’s body. This we did and when it was time to return, we found at Penukonda station that there was not a single boil on him! The ladies would draw rangolis (floral decorations) in the shape of ‘OM’ at the old Mandir. Swami used to sit on this, and we sat around Him; the men on one side and the women on the other. We sang old village folk songs. 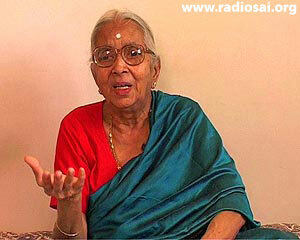 Swami’s sister, Mrs. Venkamma, used to lead the songs and the other ladies sang the chorus. Often there was no time limit to the bhajan sessions; they went on for even two hours. 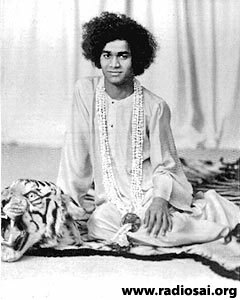 Swami often created a small silver receptacle from the sands. He warned us that He would be giving us amrit (nectar), one drop each, and that we must be careful not to waste it because there would be no second chance. When administering the amrit into our mouths, He playfully commented about the way our mouths looked. He used to say that for some it looked like that of a goat’s, for another it looked like that of an elephant, and so on. At that moment we did not laugh at His jokes because we did not want to spill the nectar! We concentrated only on consuming the amrit. I must also emphasize that the small receptacle never became empty despite the number of devotees present! On another occasion, my sister, mother and I, came to Puttaparthi. My mother asked Swami to give us a photo of Him. Instead Swami created an idol of Him which had the figure of Shirdi Sai Baba on the other side. My mother told Him that this was not what she had asked for. 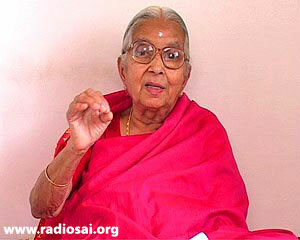 Swami, however, told her that whenever she became ill, she should bathe the idol, i.e. perform abhishekam and consume the holy water thus blessed. That would cure her. On another occasion, when my mother and I went to see Swami, He gave her a photo. The image was wet. When mother asked Him the reason of it being in that condition, He said that the photo had just come from the studio lab after being processed, and hence the wetness!